As soon as I saw Rosann's work and met her in person, she immediately became the calligrapher I wanted everyone to know about. Apparently, I was SUPER late to the game because she was already listed as a Best of in Minnesota Bride and was booked months out due to being in such high demand. Her sweet and humble demeanor made me curious to learn more. My time with her is never enough, but she's a busy bee. Tell me a little bit about yourself and the background that got you into calligraphy! I first learned calligraphy in my 7th-grade art class, and I was hooked. I loved everything about the process. Dipping the nibs into ink, (I still love the smell of the ink!) and I loved that the different kind of nibs could make different kinds of strokes, making different letter shapes. I learned more techniques in later high school art classes. When I began working as a Graphic Designer, I designed for multi-projector slide shows. These slideshows were often played on very large screens, so the work was projected to a very large scale. We worked in overlapping cells, so the artwork had to be extremely precise so that each cell would flow perfectly to the next. Being off by even a tiny fraction would show up on the large screen and through off the animation. Although I did some type design during these years, I did very little calligraphy. When our daughter was born in 1987, I became a full-time mom. Our son was born in 1991, and around 1993 I started looking for freelance work. I discovered that the graphic design industry had converted completely to computer design. The graphic design skills I had been taught were no longer being used. I found other kinds of work, but still found time to do a little bit of calligraphy once in a while. I had to give myself permission to “let go” of the need to be extremely precise, and eventually found joy of freehand lettering again. I do believe however that learning the basic fundamentals of calligraphy and my graphic design skills help me even today in what I do. A friend of a friend worked at Mpls. St. Paul magazine. I asked if they ever needed any help with the calligraphy for those Diner Award certificates that I had seen in restaurants all around town. It so happened that they did indeed need a calligrapher to take over doing those certificates. Serendipity. That was my first big account as a calligrapher. I also started doing the certificates for the American Institute of Architects. Not long after that, I met a woman at a party who owned a wedding invitation design and calligraphy business. She offered to give me some of her envelope addressing projects. She was limited to her one style and was turning jobs down. The rest, as they say, is history. What is it you love most about the art of calligraphy? For those of us who don’t know too much about it, are there different styles of calligraphy? Do they have specific names that describe them? Yes, there are many different names of calligraphy styles, or scripts, or alphabets, using different nibs and holding the pen at a specific angle. Calligraphy is writing with ink and a nib. For example, “Copperplate” is used with a pointed pen nib at a 55-degree angle, while the basic Chancery Cursive or italic is written with a broad edge nib, holding the pen angle at 45 degrees. The word font is often used to describe a calligraphy style, but it really means the name of a typography alphabet. What are the tools that you use! Pens? Ink? Explain! I use many different nibs and nib holders. I think every calligrapher has their favorite nibs. The various pointed pen nibs produce different lines. The thickness can vary, and some nibs can catch on the upstrokes on different kinds of paper. I find that some nibs work better than others with metallic inks, etc. I use both a straight pen holder, and an oblique pen holder, depending on the project. Pointed nibs are flexible so that when you apply pressure, the point opens to allow more ink to flow through the tip. The more flexible the nib, the thicker the line you can get. Some nibs can be fragile and break, they can also wear out. The broad edge pen nib is not flexible because the thick and thin parts of the letters are achieved by keeping your hand at the proper angle while making the strokes. I haven’t used my broad edge, or round hand nibs in quite a while, although I have been thinking lately that I should revisit those skills. What is the average time it takes to write 1 envelope? 100 envelopes? Each project is a little different, but I can typically address 10 to 12 envelopes in an hour. I like to limit my day to around 50 envelopes, so I can usually do 100 envelopes in 2 days. What do you listen to when you’re working? Podcasts? Music? I will occasionally play one of my albums. Between my husband and me, we still have a lot of our old vinyl, and he occasionally buys more. Album covers were typically works of art, and we have several iconic albums framed and hanging on the wall near my work area. (Santana Abraxas anybody?) But I digress. I like The Current when I am in the mood for music and I need to just sit down and crank out the envelopes. They will play everything from Frank Sinatra to Frank Zappa to Frank Ocean and everything in between. If I have on the television I like drama with lots of dialog, no need to look up to know what’s going on. Old episodes of “Law and Order” are like that. I used to like to have on CNN or MSNBC, but these days I can’t stand to hear the news. And then there are the days when I prefer nothing but the sound of the nib on the paper. It surprises me that hours will fly by before I will glance at the clock. What are some ways you are keeping a long-standing art and tradition feeling new and fresh? I have the pleasure of working with some really talented designers here in the Twin Cities. They are often the ones bringing ideas to me, inspiring me. I can feel their energy and enthusiasm, and that keeps me motivated. What has been one of the coolest projects this past year? I had fun writing “annika bridal” on their wall! It took me out of my comfort zone, and that was a good thing for me. What do many people just not know about calligraphy? It takes a lot of practice to get good. What do you LOVE about calligraphy and LOVE about your job? I love it all! 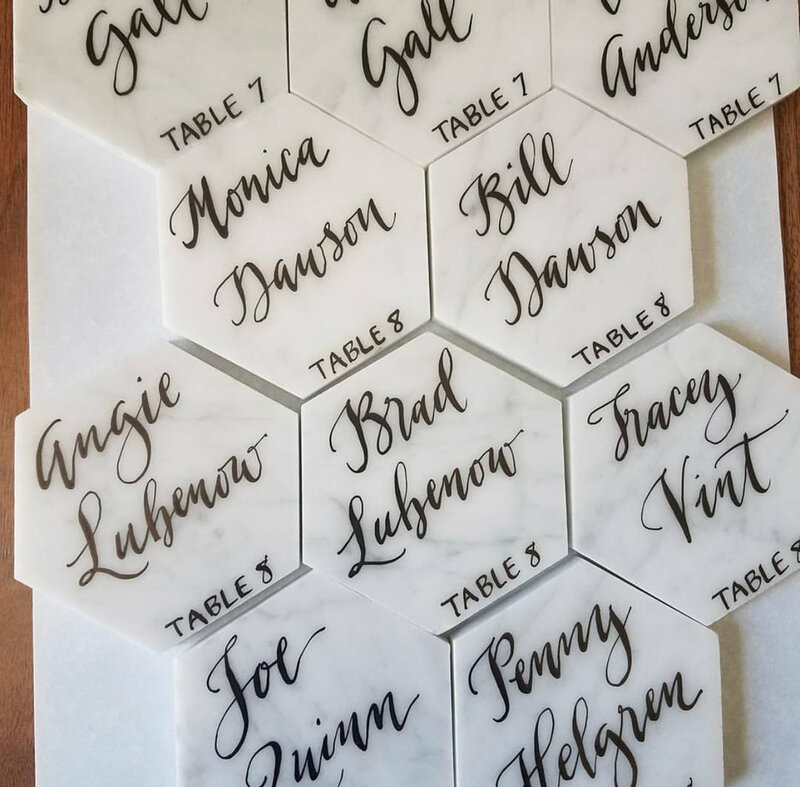 I love when I get to write out the whole invitation suite, or when I do spot calligraphy, or signage on mirrors, or place cards, or thank you cards, or quotations for wall art – I love it all! When it comes to envelopes, each name and address is different, so each envelope can be a mini work of art, especially when I can do envelopes in a free hand. I love that. I love believing that when somebody gets that envelope in the mail and sees their name and address written out as art, they really look at it, and really appreciate the time it took to write it, and the skill and care that went into that envelope. I like to believe that happens for each and every recipient that gets an envelope that I addressed. I truly do love what I do, and what has meant the most to me as a wedding calligrapher has happened a handful of times. 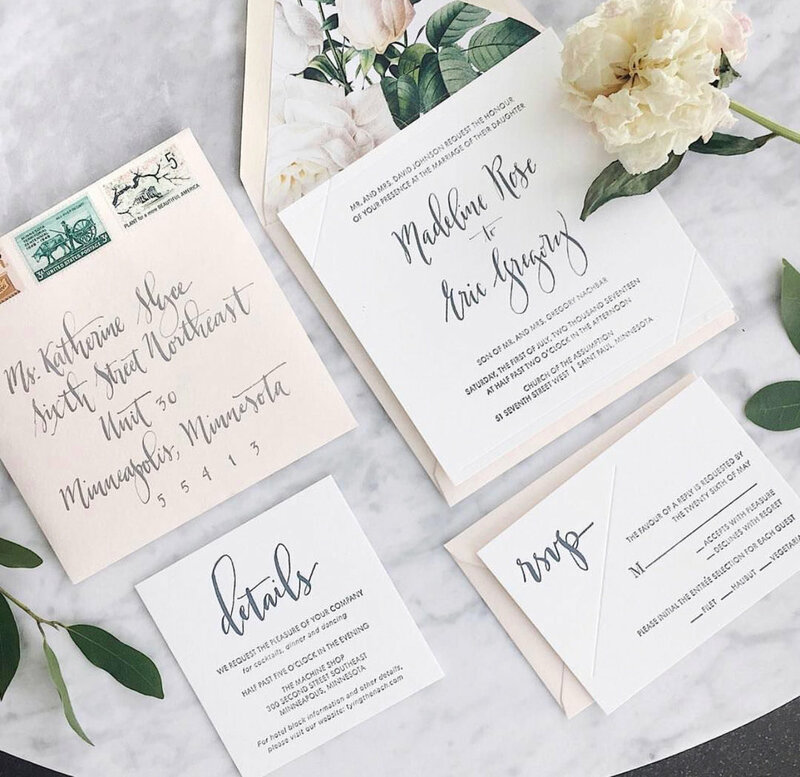 And that is, when one of my brides looks at the first envelope and for a few seconds can’t speak, and is holding her breath, and tears come to her eyes because she is so happy.